Another quick review. 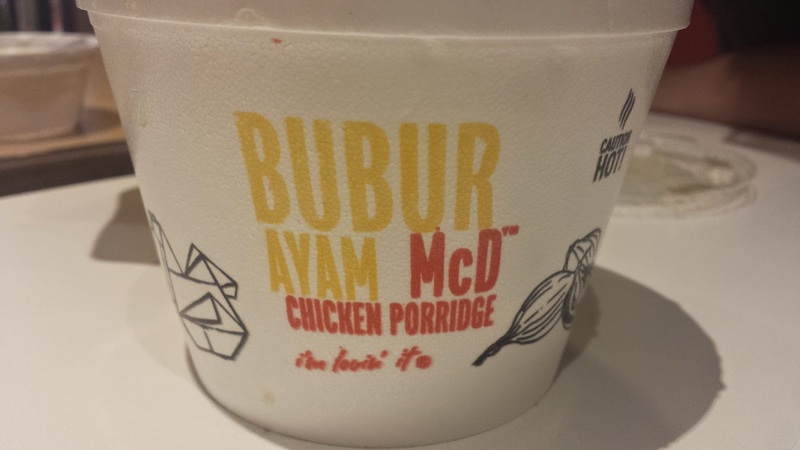 When my friend from Taiwan was visiting, and we had a number of items in Malaysia, when we finished eating we were having a conversation, and somehow it came up that McDonald's Malaysia offered "Chicken Congee" . He didn't believe that McDonald's could have Congee (Chinese for Rice Porriage), so I immediately went downstairs to order one so he, and my wife could give it a try. The only mention of the dish was on a tiny list menu on the far side of the restaurant. When placing my order, I asked for "Bubur Ayam", and the woman who took my order asked "how many pieces?" I said "one" and she said I couldn't order just one. Apparently she thought I said "Bubur Goreng" which is Malay for Fried Chicken (McWings). 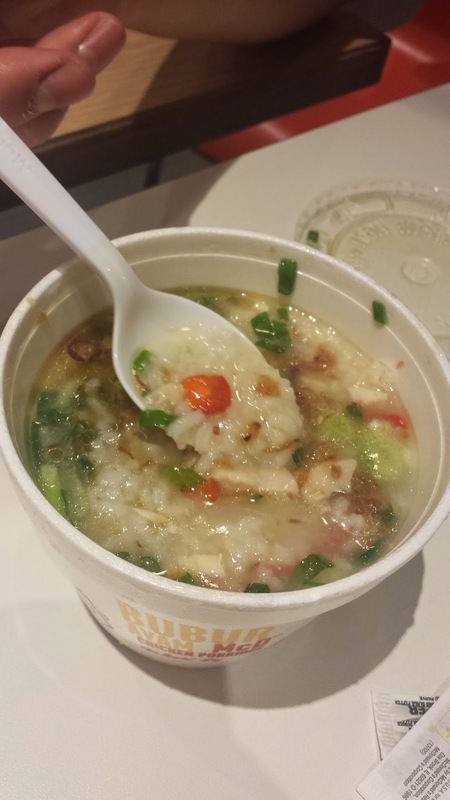 It took a couple more tries of "Bubur Ayam", but still nothing, I tried "Chicken Congee?". Nope. "Rice...Soup?" Nope. "Chicken Porridge?" There we go, that made her finally understand. I guess I should have remembered when I did the same thing in Thailand in 2012, when I tried to order their Breakfast Porridge. I've also had Bubur Ayam in Indonesia before I started this blog, so I can't recall if I had any difficulties ordering it back then. The Malay version was noticeably larger than the Indonesian one, and served up considerably more chicken and vegetables within. This is probably due to the price, this Malay one was $1.80USD and the one in Indonesia is less than 50 cents. A nice surprise was that they also had special White Pepper packets specifically for this porridge. The white pepper added a much needed kick. I say needed, because it was VERY oily. I have a feeling that it was made at breakfast, and the chicken had been simmering inside all day causing there to be a nice film of oil on top. Too bad they don't have this in Singapore, or it might become one of my go to lunches.